Touch Wheel Controller for Analog RGB LED Strips (video) « Adafruit Industries – Makers, hackers, artists, designers and engineers! 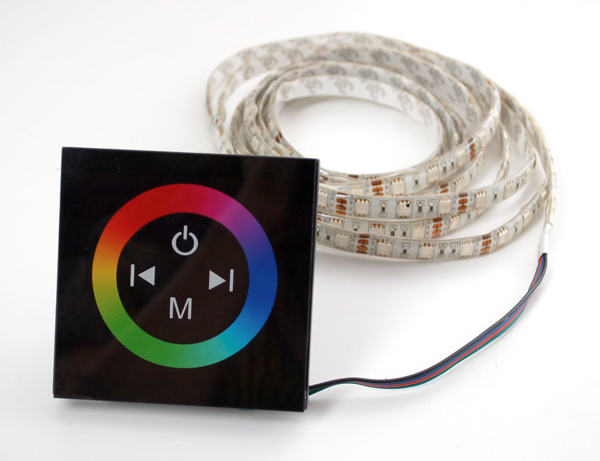 Here’s a quick video showing off our new Touch Wheel Controller for Analog RGB LED Strips! Watch the video on YouTube (and don’t forget to subscribe!) and Vimeo. This touch controller set is a quick and easy way to control a bunch of our 12V analog RGB LED strip. The box part contains power driver circuitry and a capacitive touch interface. By wiring the analog strip to the box you can easily adjust the color with the touch wheel– perfect for mounting on the wall. The box has a few ‘programs’ built in, such as rainbow fading and a really obnoxious colorful blinking effect. However, you’ll probably end up being very happy with the basic control system that the dial allows. You can turn it on or off by pressing the power button, change through programmable modes, and select the color using the scrolling color wheel.